The adventure in Spanish Tapas continues. I started a few posts ago with a recipe a recipe for Pork Meatballs with Piquillo Sauce. These little meatballs (little only in size, big in flavor!) are also perfect serve as a second course, along a slice of potato tortilla (check back for a recipe in a week) or on top of angel hair pasta – you might want to double up the recipe for the Piquillo Sauce. Now that we have the meat covered, let’s go to the beginning of the meal. This is one of the most simple, quick and easy appetizers. The four ingredients are a breeze to pick up at the store, yet the combination of flavors together will surprise you – it is beyond-words-decadent. A word of advice – you might want to make a few extra for yourself – they will fly off the plate at your party! Let’s talk a little bit about the ingredients. Do buy your dates with pits. The pits will actually keep the dates more moist – you don’t want a dried out date, do you? Plus, unpitted dates are cheaper, and who doesn’t want to save some money? The Manchego cheese comes in different “ages” or rather “months”. I chose a 3-month. A young cheese will melt much better and is milder in flavor than a 6- or a 9-month. Fig Balsamic Vinegar is a bit of indulgence. If you prefer, you can use traditional balsamic vinegar instead. What’s even better, is the reduction of vinegar – pour the vinegar in a small pot and simmer until it reduces in volume by half. 1. Preheat broiler on medium. Line a baking sheet with alluminum foil and set aside. 2. With a pairing knife, make a slit on a side of a date and remove the pit. Place a piece of cheese in the cavity of each date. Try to hug the date around the cheese, so as the cheese melts, it still stays inside the fig instead of oozing on your sheet pan. 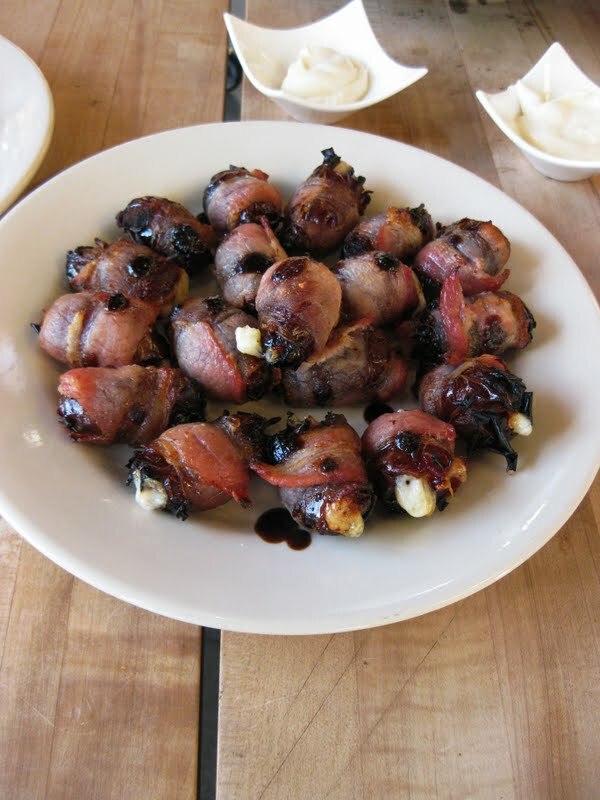 Once the cheese is hugged, it’s time to hug the date – in bacon! 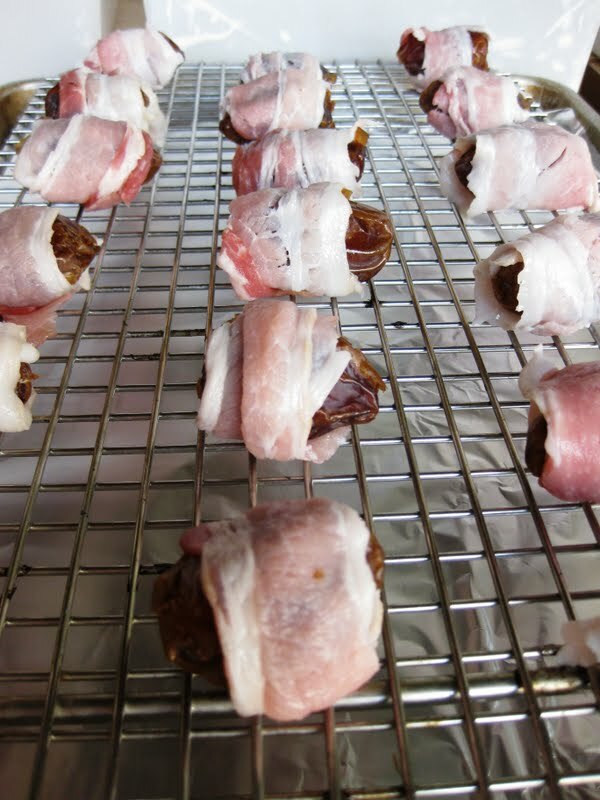 Place the wrapped dates on top of a cooling rack instead of directly on the baking sheet. The cooling rack raises the dates just enough so that the hot air circulates and cooks the dates more evenly and faster. 3. Broil dates 3-5 minutes on each side, until the bacon is crisp. 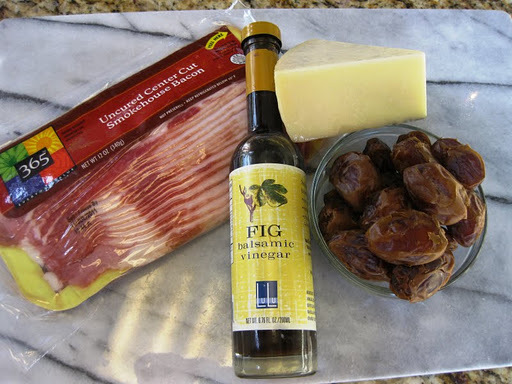 Carefully remove the dates on a serving platter and drizzle with Fig or Balsamic vinegar. Serve right away.